There is so much homegrown musical talent in the Coachella Valley and there are so many unique venues to listen to it. 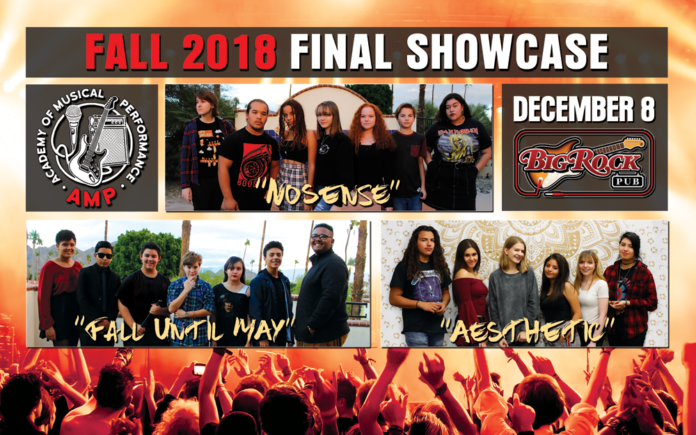 This Saturday, December 8, you can see that talent at its genesis as the musically gifted kids from the Academy of Musical Performance take the stage at Big Rock Pub for their Fall Showcase. This showcase is a culmination of twelve weeks of rehearsals featuring 3 AMP Fall 2018 bands (Nosense, Aesthetic, and Fall Until May) along with two acoustic acts. The young musicians will perform both original original and cover songs in this daytime performance from 1 – 3 pm. This great afternoon of music made by young people is a free event to all ages. Big Rock Pub serves delicious food and cold beverages, so attendees can enjoy lunch, listen to music, and support the program. In this contemporary music education program, the students get to choose songs they play and generally choose from their favorite songs and songs they’re listening to. A small sampling: The Smiths, Imagine Dragons, John Mayer, Tears for Fears, RHCP, Harry Styles, and The Killers. Each band plays five songs (or 20 min worth of songs), while acoustic musicians play three songs. 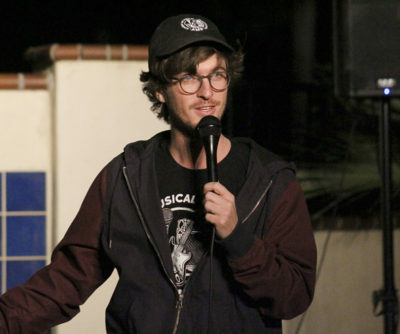 Will is also a successful and talented singer-songwriter in his own right, as lead for his band brightener (which had the distinct honor of being chosen to play at Coachella Music Fest in 2016.) If anybody is interested in learning more about AMP or getting involved as a volunteer, instructor, or student, Will Sturgeon will be on hand and happy to chat with anyone about all things AMP. In three short years, AMP has become well-known and well-respected for its fantastic summer music camp, where the valley’s top musicians use small rock band format to teach the young musicians performance and concert production skills through rehearsals, workshops, individual instruction, and live performances. A year-round after school program was added after the 2016 summer camp to provide instruction and performance opportunities all year round at a variety of events in our community. The AMP program was seed funded with a 3-year grant from Goldenvoice to get the organization up and running. “Without the support from Goldenvoice, there is no way we could have launched this incredibly valuable program to our Valley’s youth.” states Kate Spates, AMP Volunteer CEO and co-founder. 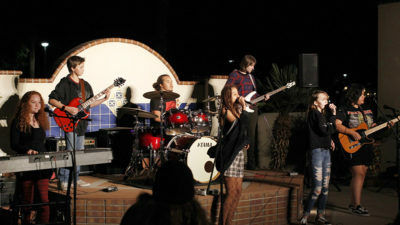 “Now we are looking to our community to continue to support the goals of the organization.” The AMP mission is to enrich the lives of young musicians by fostering productivity and social responsibility through creativity, communication and collaboration in the development and enhancement of musical performance and concert production skills through participation in a “rock band” style educational setting. AMP students have been enthusiastically embraced by the community. Students from this session were invited by Jimi Fitz to attend a fantastic event last weekend at the McCallum Theater to see jazz singer/songwriter Peter Cincotti. The AMP students also performed at the Tamale Festival this past weekend. 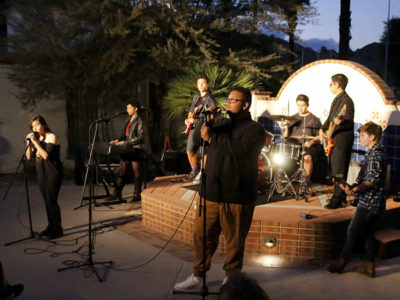 The weekend after the showcase, the kids will perform at CAM Fest (Children Arts Music Fest) at the Indian Wells Tennis Gardens on December 15. There are a lot of exciting performance opportunities coming up next spring for their spring session as well. The kids will be playing at Swing ‘N Hops Street Party on El Paseo on Saturday, February 2 from 1-5. Some cool AMP facts: AMP alumni bands, or AMPlumni bands, have done some great things since their session. The band Traveler made it to the semifinals of Alice Cooper’s Proof Is In the Pudding competition in Arizona. Another AMPlumni band, Sol Suns, played at Tamale Fest. Alumni band, UU, played at Sticky Fest (which a lot of CV Weekly Music Award winning bands played). Current and former AMP students take what they’ve learned and apply it to their own bands, carrying on their AMP legacy. To fundraise, AMP’s logoed merchandise will be for sale and they are also accepting donations to their non-profit program, as always. All proceeds help fund scholarships and buy equipment for students who may not have been able to participate in this program otherwise.